…what children of the low desert think of Autumn. The heat is still upon us, although hints of coolness weave through our evenings and early mornings now. In our old, irrigation neighborhoods like ours, Autumn colors are brown, tan and emerald green. …only a few days pass and suddenly a blush of emerald green covers the tan and brown manure-strewn ground. Suddenly our lawns are green and delicious, covered in tender blades of succulent emerald green. …and it is Autumn in the low desert. Russets and golds and bronze and scarlet glow from plastic Halloween pumpkins and wreaths covered in fabric leaves. And for those of us who have experienced Autumn elsewhere, we yearn. Our hearts desire chunky sweaters worn on mornings so crisp it makes inhaled breath burn…just a tiny bit. We crave that particular, heart-stopping delight when we see a hillside glowing like fire beneath a sky so blue it hurts your heart. We long for the texture and crunch of walking through the pumpkin field to find our own perfect, leathery smooth jack-o-lantern. Will our Grandlittles look back fondly and remember the colors of Autumn in the low desert? Brown, tan and emerald green. In answer to some of your questions, the summer lawn is perennial. It comes back each year but looks like dead grass all winter. 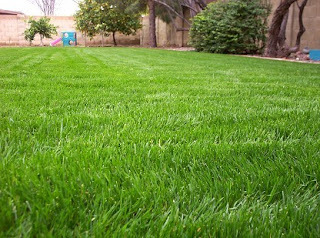 Since winter is our best weather when we are all outside, lawns are overseeded with rye. It is a controversial practice in some areas because of water usage. We are blessed here with an over-abundance of cheap water from our canal systems and deep ground reservoirs. Irrigation water is very cheap and plentiful. That is completely new to me. I'd no idea that there was summer grass and winter grass, but of course it makes sense. I'm sure that the children will travel and enjoy autumn elsewhere, but the season will always be linked to that brilliant, new grass. 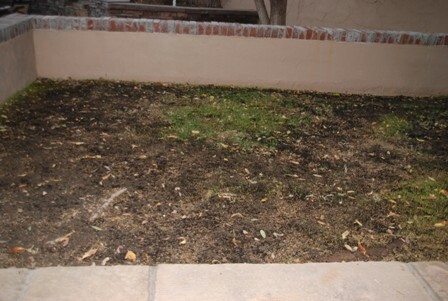 Our grass is brown in winter too. Lovely lawn you have there! Plush! Wow!We have too many little boys rolling around to have anything looking that nice! We need all-weather grass here in S Spain to withstand scorching Summer temperatures and Winter monsoon-type rainfall! Our lawn in winter looks the same as it does in summer. The only difference is now I don't have to mow the rocks. I think it's interesting to read about the seasons out west - so contrast to what I'm use to, yet curious am I to see first hand some day. For now, I'll enjoy our vibrant (I hope anyhow)reds, oranges, and yellows here in the east. fresh cider pressed while you wait!!! Our lawn goes brown in the winter.It would be lovely to have it green all year. We had our first really cool morning today. I tured on the heat! Floridians are kind of scared of the cold, but oh, how I do miss the fall colors of my youth! Maybe you could take the grandlittles on a special trip to Vermont or some such... THAT would be a memory forever, for sure! 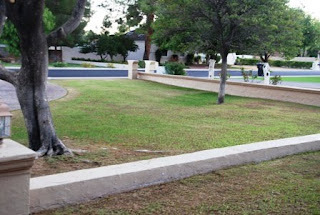 This was interesting to hear about the two kinds of grass, and also to think about "fall colors" in the desert. I would miss experiencing fall as I know it, but hey...if you've never had it...you can't miss it, right? Just like I don't miss snow at Christmas because I've never had it. Yet I do associate snow with Christmas because of the decorations, songs, etc. So pumpkins and wreaths and spiced cider will still give the grandkids fall memories. And maybe somebody in town should make a faux pumpkin patch to visit! We should have colored leaves by now, but everything is green ! Anyway fall for me is to fall asleep, I don't like this season, I think I should go to Australia now, where spring starts ! I have never heard of that practice! But it seems to work for you....and I am glad to hear that you have plenty of water to use, that is what those canals are for, right! I actually like the look of rye grass, too bad it isn't perennial. Our grass in my part of the country is mostly green because of all the rain we get, but we let it go brown for the most part in the summer due to lack of rain and water shortages. Our winter clothes have been pulled from the basement, the flowers are being slowly attacked by frost as each morning is colder and colder and we have already turned the furnace on...just enough to take the chill off the morning. Oh, and let's not forget the time change that is coming...we wake to pitch black...but soon it will be dark at 5 pm...such a sad event...then changing of the clocks....that always signals the end of being outside to me. Your Grandlittles have it great, Jenny, golden and russet autumn colors or not! You made me think of Ireland with your Emerald Green! Ah Jenny please tell Judie I have LOTS of grass she can borrow! Ha ha, this so reminds me of what our autumn is kind of like, so I pretty much know what those children are probably thinking...although it's like my nephew from Florida who saw snow for the first time...get these children to the east!!! Maybe not this year though.....youtube has lots of nice real autumn like photos! I have to go and look back in my grandfather's photo albums of his autumns in Florence, Az and not the prison either...he lived on a ranch ! I liked your post for autumn colors berry, very much! haha...love it. And you'll be wearing shorts (in fall colors, no doubt) while those of us who have "true" autumn will be breaking out our thermals and longing for emerald green! Enjoy! I am really hoping that I won't have to mow our grass again this year. It's a pain and, now that Mark has moved out, it's back down to me to do it. Your rye grass is looking quite lovely! I couldn't bear to live anyplace hotter than here, I can hardly tolerate ours. Arizona has so many lovely factors, that we must overlook the lack of fall. :) It is basically the same here...but our grass just turns brown and crunchy. And it is OUR outdoor weather that we love in the winter too. Perhaps a fall trip to the Carolina mountains would be ideal for you and those kiddos one year. I have a post tomorrow about fall in my yard. I did not know this. I would love the green lawn through the Fall and Winter. Soon we will not even see the yellowed grass and the brown dirt, soon everything will be white for months. I would take your green, I would. My in laws have been out to visit us twice now since we moved to this part of CA. My FIL always says the same thing..."everything is brown" I tell him..."it's summer... you need to come in the winter!" hahaha. What a beautiful colored lawn! We don't get much of an autumn in LA, but where I live we do get a taste of it! I love green grass! Our is turning brown. This is fascinating,really, and I'm glad you took photos of the lawn.....but I can't be sold on dessert living. Were it not for some of the folks who lived there, I could easily pretend it away. You know, heat+PJ= misery. Sun+PJ= misery. Humidity or not, it's all the same to me.